Butterfly Dancer, Mateo Romero, 48x60”, mixed media on canvas (mm/c), 2018. Photograph by Karl Duncan. The Museum of Indian Arts and Culture (MIAC) is pleased to present this nationally-recognized art market, bringing together over 200 of today’s most prominent Native American artists at the Santa Fe Community Convention Center. 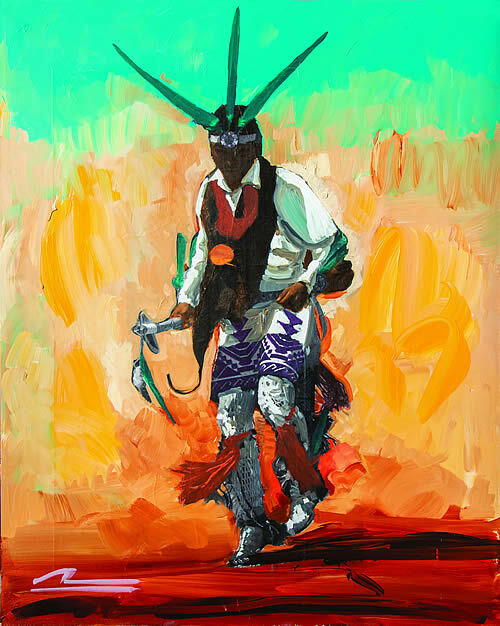 Meet outstanding artists, representing Pueblos and Tribes from across the United States—from traditional to contemporary, and from emerging to established. Enjoy their jewelry, pottery, paintings, basketry, beadwork, carving, sculpture, and textiles. The museum is proud to promote living Native artists. Since its inception in 2005, Native Treasures has generated more than $4.5 million in sales for Native American artists. This year, the museum hosts a new event: the Living Treasures Artist Celebration on Museum Hill on Friday evening, May 24. Guests are invited to meet the 2019 Living Treasures artist award recipients, Diego and Mateo Romero, and meet and mingle with past years’ illustrious Living Treasures artists. Enjoy contemporary Indigenous cuisine and Native American music and entertainment. There will be a live auction with exceptional art objects offered by Living Treasures artists. In addition, there will be a silent auction of Native American art. The museum offers sponsorships from $250 to $5,000 with a range of benefits, from tickets to the Friday evening Museum Hill event, to an intimate dinner with the Romero brothers in a private home one evening in May. Tickets to this evening event are $150 per person.